Parties are fun, but if you are the person organising them they can also be stressful. Making sure that there is enough for everyone to eat is the biggest headache. It takes a lot of time and organising, and it is all too easy to forget something, but there is an easy way to take care of all of the party food you need. Just hire the Hog Roast Harrogate team. We have over a decade of experience. 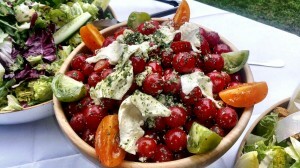 Our professional chefs can easily provide you with great food, and do so for a low, per head, cost. Over the years, we have added to our menu. 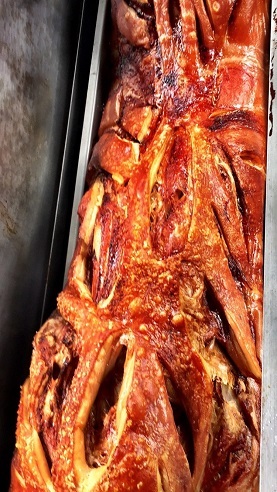 Roasted hogs are very popular. They look great, smell wonderful and can easily feed a large group and do so quickly. 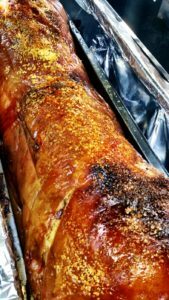 Spit roasted hogs are still our most popular item, but we also offer a range of other meats that we can either barbecued or spit roast. Our chefs use the best ingredients and wherever possible source the food locally. This helps to ensure freshness, keeps the price down, supports the community and keeps our carbon footprint as low as possible. So when using Hog Roast Harrogate to cater for your event you are deciding to support local businesses too! 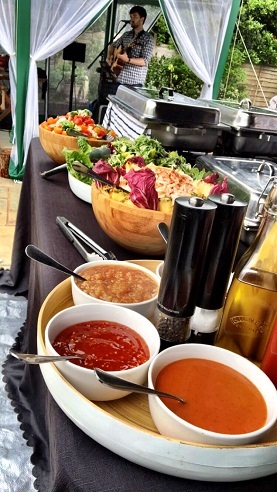 On the day of your event, your catering team will arrive in good time and set everything up. All of the food will be freshly cooked in front of you and your guests. Once cooked it can either be laid out on a buffet table or served to your guests at the table, the choice is completely up to you. You choose what food is served to your guests. Our menu choices are extensive. There are salads, roasted meats, cold cuts, side dishes, desserts and platters of finger foods and canapés available to choose from. If there is anything in particular that you are looking for but can’t see on our menus then please do ask as we would be more than happy to try to match exactly what you imagined for your special event. Hog Roast Harrogate also feels very akin to the past, as we have adopted what was a medieval method of cooking and breathed new life into it with our modern interpretation of it. Whilst we are very respectful of our culinary ancestors, we have taken hog roast cooking to a whole new level with our innovative hog roast machines and contemporary menus, ensuring this glorious tradition lives on and can be enjoyed by everyone in Harrogate, no matter what the occasion. One of our classic hog roast feasts would be the ideal catering choice for a traditional wedding reception in one of Harrogate’s grand Edwardian hotels. Alternatively, because our equipment is so practical and easy to transport, one of our more informal buffets would be a great option for an outdoor party for family and friends after spending the day spotting stone animals at Brimham Rocks. With our perfect balance of traditional methods and modern menus, Hog Roast Harrogate can cater for any type of event, and unlike Mother Shipton’s Cave, our prices certainly won’t petrify you! If you prefer we can offer our DIY serivce – our hog roast hire packages. We are able to deliver a hog roaster to your home or party location for you to use. This option allows you to cook your own food for your guests and take the credit for yourself! 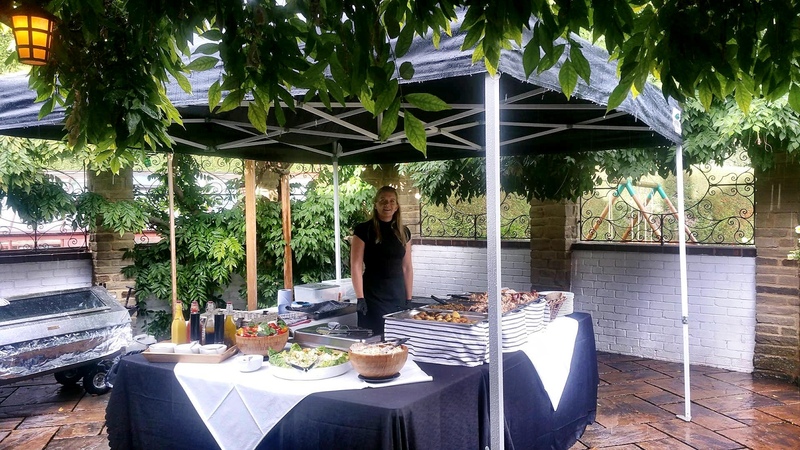 Our hog roast hire packages and catering menus are all very diverse and we have options to suit every event and every budget. So whatever you want, we can provide it. Just give us a call or fill in the form on this website to get a tailored quote.